My passion for foliage wins out for this week’s pick from the TBG gardens. Although I do love flowers, I must admit that I love leaves even more. 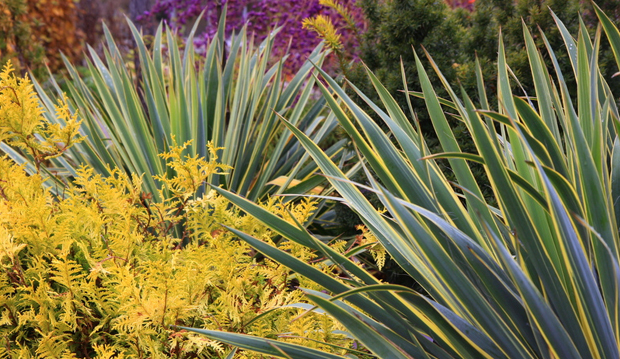 This week, I have chosen to highlight a great combination of two hardy evergreen plants in the President’s Choice Show Garden: the bold shape of Yucca filamentosa ‘Bright Edge’ provides a striking contrast in form and texture to the fine foliage of Chamaecyparis pisifera ‘Vintage Gold’. Although the colour intensity of the foliage of each plant may vary depending on the time of year, the dramatic contrast remains constant and I could easily highlight this pairing in any season, including winter. Once established, both plants are tolerant of rather dry soils during the summer months. Plant spring flowering bulbs in the fall near or at the base of each. And that reminds me, have you planted your spring-flowering bulbs yet? It’s not too late! I hope to finish my plantings this weekend. Tip: Although Mother Nature has thankfully provided some much-needed moisture this fall, be sure to check the base of all your evergreen plantings to ensure that they do not go into the winter dry—water them in well. The intensely purple berries of the Callicarpa (beautyberry) provide a beautiful backdrop to this combination. Head Gardener Sandra Pella highlighted this shrub a few weeks ago in her What’s in Bloom blog; be sure to keep checking Sandra’s blog for other visual treats from the TBG gardens.